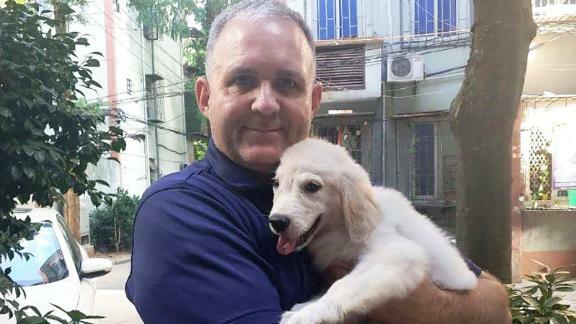 US citizen Paul Whelan, who faces up to 20 years in a Russian jail on espionage charges, was denied bail in a Moscow courtroom. CNN's Fred Pleitgen has more. The GOP-controlled Senate is expected this week to vote on the border security proposal pushed by President Trump to help end the partial government shutdown. This plan would give Democrats temporary protections for DACA recipients in exchange for Trump's $5.7 billion funding request for a border wall. Democrats call the plan a non-starter, and it's not expected to pass the Senate. The Democratically controlled House will hold votes this week as well on funding measures to reopen the parts of the government that are closed. Those are expected to pass the House but be DOA in the Senate. It all means the nation is no closer to an end to the shutdown nightmare, now 32 days old, that left 800,000 federal workers furloughed or working without pay. Another day, another explanation from Trump lawyer Rudy Giuliani. On Sunday, Giuliani said President Trump's conversations about a proposed Trump Tower Moscow project went on straight through the 2016 election. This, of course, contradicted the President's claim during the election that he had no dealings with Russia. So, on Monday, after a full-blown firestorm erupted over his comments, Giuliani walked it all back, saying he was only speaking hypothetically and there was no way of determining exactly when the discussions ended because they had no record of it. The project is a key part of the legal saga facing ex-Trump attorney Michael Cohen. It's also come up in special counsel Robert Mueller's investigation. Some political star power will be missing when the World Economic Forum -- the annual confab of the rich and the powerful -- kicks off this week in Davos, Switzerland. President Trump won't be there because of the government shutdown. British Prime Minister Theresa May is skipping it because she has to deal with this little thing called Brexit. France's Emmanuel Macron, China's Xi Jinping and India's Narendra Modi also won't be there because they're all handling various domestic crises. But the mix of CEOs, bankers and politicians that do make it to Davos will still have lots to talk about: Trade wars, the slowing global economy and climate change, just to name a few. And maybe they'll talk about the new report from Oxfam that says 26 billionaires are as wealthy as 3.8 billion people. Keep up with the latest from Davos here. Twitter suspended the account that helped spread video of an encounter between a Native American elder and a group of high school students. CNN Business asked about it after discovering the account, which claimed to belong to a California teacher, was actually connected to a blogger in Brazil. The account was deemed suspicious because of its "highly polarized and yet inconsistent political messaging" and its unusually high rate of tweets. The video sparked outrage this weekend, when it seemed to suggest the students, most wearing Make America Great Again hats, were harassing the elder. But a longer version of the video now casts some doubt on that. Climate change is hitting Greenland hard -- and it may be too late to do anything about it. The sobering assessment comes from a new study that says a warming Earth is melting Greenland's massive ice sheets much faster than previously thought. The study's lead author says we may have reached the point of no return when it comes to fighting climate change and the "only thing we can do is adapt and mitigate further global warming." Melting ice sheets mean rising sea levels, which is especially bad news, since almost half the world's population lives in areas vulnerable to rising seas. Paul Whelan, the US citizen accused of spying in Russia, has a hearing this morning in Moscow. Academy Award nominations come out later this morning. "A Star is Born" and "Roma" are expected to lead the noms, but Oscars ratings would probably be helped by a dose of "Black Panther." We all knew Jon Bon Jovi was a great guy, but he just proved it again. His New Jersey restaurant is now offering free meals to furloughed federal workers. Love cruising but hate hanging around kids? No worries. Richard Branson's new cruise line offers an adults-only "rock star" cruise. Hold your fire, book lovers. Decluttering queen Marie Kondo doesn't really want you to get rid of most of your books. The NFL will think about making pass interference calls reviewable after that awful no-call against the Saints (as my editor continues to sob). Meanwhile, Atlanta Falcons fans (like me!) are still celebrating. "You know that the end is coming, but it doesn't make it any easier." Skier Lindsey Vonn, who is seriously thinking about retirement after failing to finish a race over the weekend. Vonn, considered the greatest female skier in history, had just recovered from a knee injury.